In order to highlight the work of particularly productive and influential researchers on contemporary European Jewry, the European Jewish Research Archive is compiling a series of 'author collections', available on this page. Each author collection showcases a small number of items that demonstrate the depth and breadth of a particular author's body of wok on contemporary European Jewry. New author collections will be added to this page over time and collections will be amended in the future to reflect new wok by the selected authors - so please do check this page regularly. 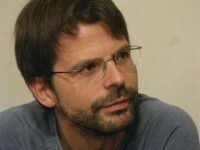 Olaf Glöckner is a researcher at the Moses Mendelssohn Centre for European-Jewish Studies in Potsdam (MMZ), Germany. He is also Lecturer at the Historical Institute and at the Department of Jewish Studies at Potsdam University. His research focuses on transnational Jewish migration, German-Israeli relations, modern antisemitism and strategies of prevention, genocide studies and European-Jewish developments after 1989/90.